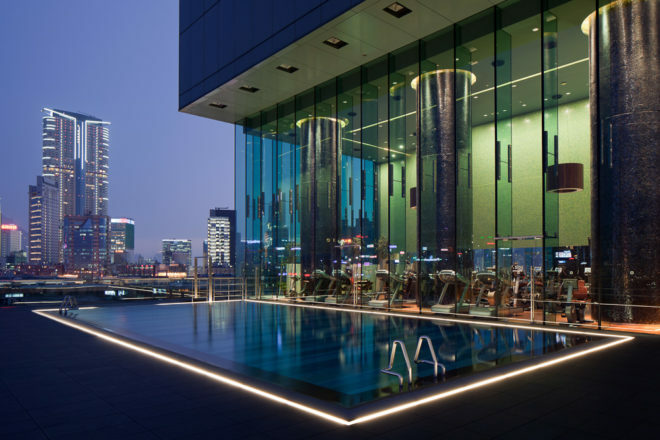 The pool with views across Hong Kong. 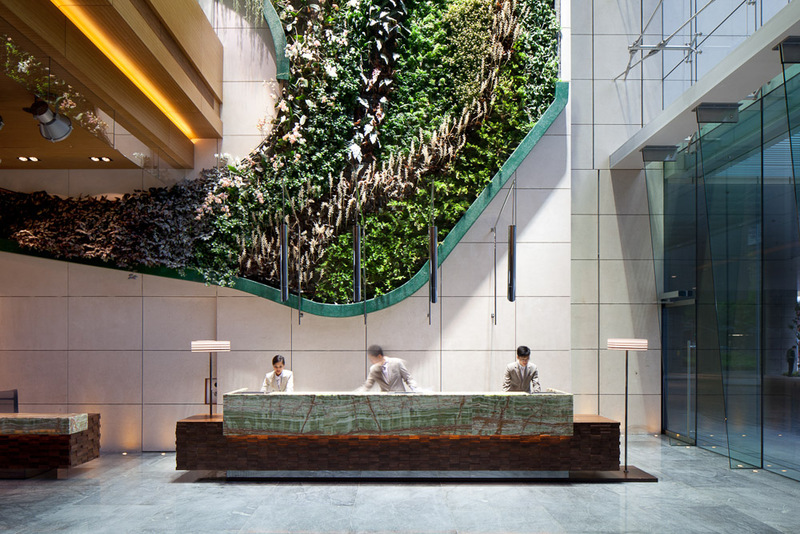 A hanging garden sets off Hotel Icon's lobby. You'll find it difficult to leave Hotel Icon's elegant rooms. 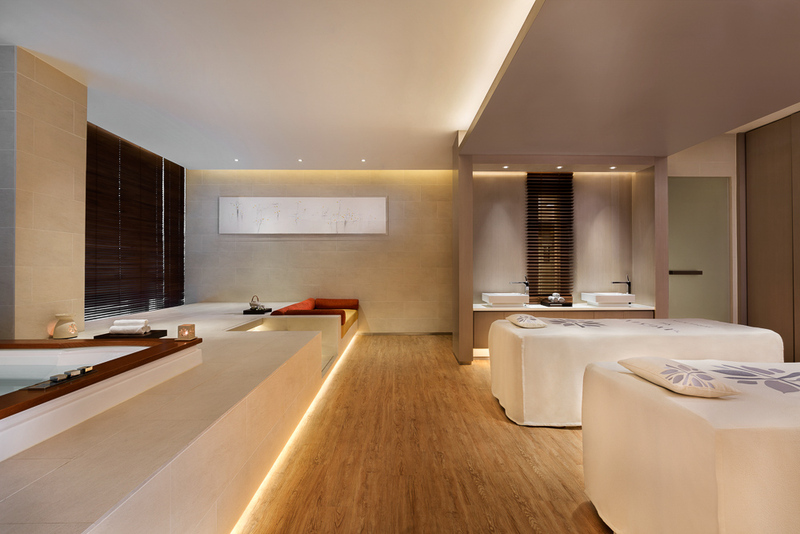 For two: Angsana Spa at Hotel Icon, Kowloon. Got a couple of days in Hong Kong? Get as high as you can in Hotel Icon, which doubles as a finishing school, writes Daniel Down. With its impressive skyline and massive scale forming a striking contrast with ornate Taoist temples and traditional gardens, Hong Kong demands you tease out its every intriguing corner. And with more people living above the 14th floor than anywhere else on the planet, the best way to see this most vertical of cities is to follow suit, and eschew the boutique for the big, tall and modern when choosing a hotel. With that in mind we make our way to Hotel Icon, on the Kowloon side of town, a quick hop by taxi through the teeming metropolis, a trip that I regret not taking in one of the hotel’s fleet of all-electric self-driving Tesla sedans, as if it isn’t all futuristic enough already. The hotel’s structure would be noteworthy, but is utterly unremarkable here alongside countless similar blocks of steel and glass. It does, however, have an enormous rectangular void in its exterior that forms a passage through its heart, a seemingly glaring omission in a city where space comes at an extraordinary premium. But these voids are in skyscrapers all over Hong Kong, a feng shui architectural practice to allow dragons to pass unhindered. Residents here swear that the best part of town is Hong Kong Island, but a room high up on the opposite side of the harbour affords impressive views across to the island’s forest of skyscrapers. The higher you go the better, and so it was most welcome when the receptionist offered us a room a further two levels up on the 23rd floor owing to a cancellation. We settle into the Harbour View King room just as the nightly show of lasers, towering digital displays and blazing neon advertising gets underway. From the vantage point of a Karuselli armchair in front of floor-to-ceiling glass, the city is like a vast computer chip, thrumming with electric energy; the Hong Kong I’d longed to see. The following day we receive a blast of hot, humid air leaving the airlock-like doors of the lobby, which has a colossal hanging, tropical garden a few stories high weaving its way across the space, bringing a welcome swathe of green to the glass and marble surrounds. Looking at the heavy clouds, the doorman anticipates our need for umbrellas. Indeed, what marks Hotel Icon out from the crowd is that it is also a finishing school for elite students entering the hospitality industry, an offshoot of the School of Hotel & Tourism Management down the road. Our young-looking doorman, under the watchful eye of the more senior members of the concierge team, quickly learns our names, fixes us taxis, always with a handle on what the unpredictable weather might do. This is one of those hotels that tempts us to end our day of exploring prematurely. Our room is elegant with neutral tones and just a hint of Hong Kong glamour in the gold-embroidered pillows. It’s lit to relaxing effect and has a spacious en suite with a deep bath, and a king-size bed that is hard to leave. There’s also a free mini bar, replenished every day, to grab a cold beer to supplement time well spent admiring the city from the swivel armchair. Come afternoon, we decamp to the heated outdoor pool with vertigo-inducing views, adjoining saunas, steam rooms and omni-directional showers. Early evening drinks, no doubt served by a barman doing a Bachelor of Science in cocktail-making, are taken at the adjoining bar to restaurant Above & Beyond, serving some of the city’s best Cantonese from executive chef Paul Tsui. On the 28th floor, a table for two with panoramic views makes it hard not to break with decorum and have a phone at the ready to take shots of old red-sailed junks meandering down the harbour. Killing time the next day in the dedicated lounge reserved for guests transferring to the airport, from where you can make use of the pool one last time, I realise we’ve had the perfect city break thanks to Hotel Icon’s location, comfort and efficient staff (I’d pass them with flying colours). It’s been a pleasure to join Hong Kong above the 14th floor; next time I’ll aim even higher. The IT Verdict: Comfortable and luxurious without being ostentatious, it’s a great spot from which to explore one of the world’s great cities. It has clear lines of sight across the harbour for spectacular views of Hong Kong Island and is within easy walking distance of the famous old ferry and metro. While fashion designer Vivienne Tam has curated a suite here, the rooms are simply elegant, functional, relaxing spaces. The staff could be under the watchful eye of an examiner at any time, so service is efficient, not overly familiar, and they’ll make sure you never get caught in a downpour without an umbrella. We love the bottomless mini bar, and the deep bath proved essential after hours of walking in the expansive Nan Lian Garden and adjoining Chi Lin Buddhist nunnery. Fine Cantonese jostles with the view to be the star at Above & Beyond, plus there’s a high tea to be had at lobby cafe Green, and buffet at The Market. Forgo the latter and make your way to Hong Kong’s Mid Level for a host of must-try restaurants. A harbour view plus five-star facilities and service for a reasonable $286 a night.